I’m writing to urge you to sign SB328, to provide California’s adolescents with healthy school start times as recommended by the CDC and every major medical group. The American Academy of Pediatrics calls chronic sleep loss in children and adolescents "one of the most common - and easily fixable - public health issues in the US today." Some argue that each school district should make its own decisions on this issue. However, despite a clear scientific and public health imperative, most local school districts have failed to act. State governments do not leave a vacuum when important public health issues that affect our young people are present. That's why California has established anti-bullying standards, for schools, requirements for the reporting of child abuse, and requiring that children receive vaccinations before stating school. Without this bill, students will continue to have to attend school at times linked to lower academic performance, decreased attendance and graduation rates, and increased suicidal ideation. The science is clear. To do nothing is to do harm. I urge California to once again be an example for other states in promoting the health and well-being of our children. 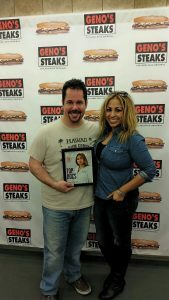 ​She was also added to the Celebrity Wall of Geno’s Steaks! 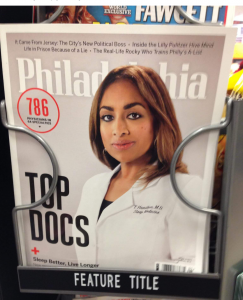 Look for her the next time you get a cheesesteak! New Jersey Sleep Society, Inc.